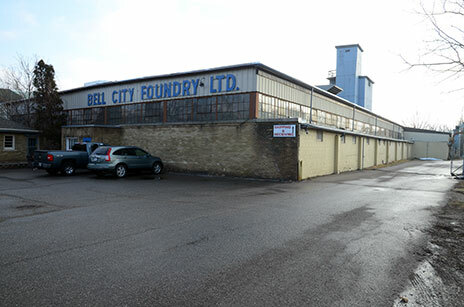 Why Choose Bell City Foundry Ltd.
Bell City Foundry (Brantford) Ltd. supplies a large range of castings – hubs, pulleys, valve closers, brake drums, cultivator parts, etc. – for the gas and water meter markets, processing plants, refineries and utilities, etc. With the use of the Hunter 10s, Disa Forma, and Koyo we are able to pour different grades of Grey and Ductile Iron; with weights ranging from 1 oz to 100 pounds. We have two (2) Hunter 10 Automated Automatic Moulding Machine. The size of the Pattern Equipment is 14” x 19”. This machine produces on average 75 moulds per hour. We have a Disa Forma 3030 Horizontal Moulding Machine. The size of the Pattern Equipment is 20” x 26”. This machine produces on average 100 moulds per hour. Bell City Foundry has two (2) different types of Core Moulding Equipment. We have a Shell Core equipment and Cold Box Process equipment. We have two (2) Harrison (1612 Model Number) Shell Core machines. Shell Sand is a resin coated sand excellent for use for small cores and where storage is required. Large cores can create gas problems in castings due to raw sand in the bodies of the cores. To learn more about our capabilites and what we do click here. Copyright 2015 - Bell City Foundry Ltd.